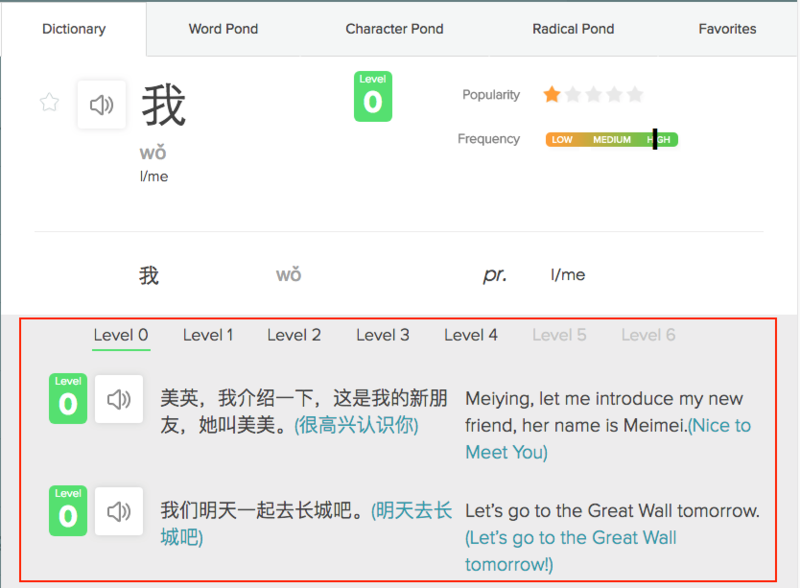 While learning new characters and phrases through Ponddy Chinese Smart Textbooks, there is a special vocabulary learning tool called the Word Pond Panel. The tool can be accessed from within every interactive lesson (Pondlet). It is activated by clicking any words in the vocabulary section of a Pondlet. When activated, the first tab that appear in this tool is Ponddy Dictionary. It is a result of an extensive research that combine resources from the ACTFL (US language proficiency guidelines), CEFR (European standard), HSK (a Chinese proficiency test for simplified Chinese ) and TOCFL (Chinese proficiency test for traditional Chinese). In addition, the dictionary also incorporates the most prevalent vocabulary in the Chinese language. By integrating all these high standard resources, Ponddy Dictionary provides more than 20,000 entries. Each of the entries are properly labeled according to their level of difficulties that range from level 0 (beginner) to level 6 (Superior). Thus, Ponddy Dictionary ensures learner’s exposure to the most relevant words of the language and more. The Dictionary tab will show up and slide from the right after clicking on any word from your vocabulary list. It includes many features that puts together all the essential components for learning. In the picture below. 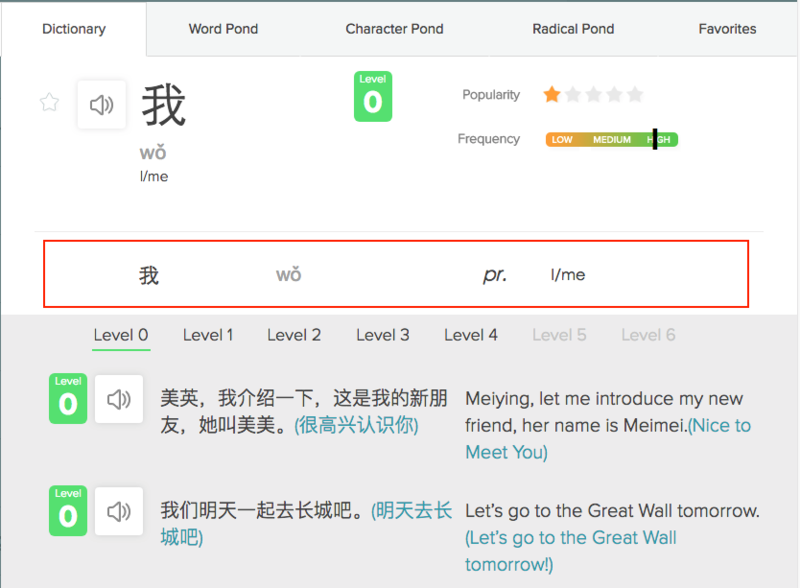 For example, the word 我 or I/me is shown through the Dictionary tab. 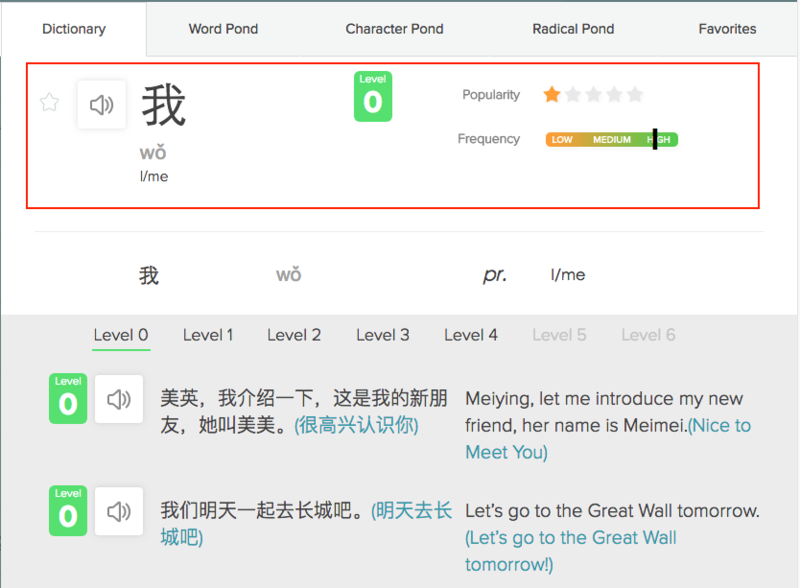 After clicking the word “我”, the Word Pond panel slides out. The Dictionary tab is automatically selected already. As you can see, the Dictionary is located in the word pond panel which is separated into three fundamental sections. This first section includes all the general information about the word. This information includes: the character itself, its pinyin, the definition, level of difficulty, its pronunciation, along with how often it is used in natural language. The second section contains the part of speech of the word along with other definitions. Sometimes you will find more than one entry if there is multiple definitions or uses. In this case, there is only one entry as we see that it is a pronoun and there is only one definition. In the final section, which is distinguished by a grey background, you are able to see the word used in different types of sentences. You can also select different levels using the filters to find sentences for your appropriate level of difficulty. Even if you are more advanced you are also able to go back and review sentences from lower levels typically known as the practice of recycling. This is important because as people continue to learn Chinese they will begin to forget characters and phrases that they have learned in the past. Overall, the Dictionary tab is a useful and interactive tool that will help you familiarize yourself with new vocabulary. This will help you learn and develop the skills to use during communication.